Korean Air has announced changes to its flight schedule in time for the 2018 winter season, which commenced on October 28, 2018. The changes include launching new routes and increasing service frequency on key routes that have shown steady growth. Korean Air has launched a new, regular service between Danang, Vietnam, and Busan, Korea, which will run daily and operate on Boeing 737-900 aircraft (top). The Busan-Danang flight, KE465, will depart the Gimhae International Airport at 09:25 PM, arriving at Danang at 12:20 AM the next day. KE466, the return flight will depart Danang at 02:45 AM and arrive at Gimhae at 08:30 AM. Korean Air will boost the frequency of the Incheon-Istanbul route, which has shown a steady increase in demand and will now be operated four times a week. Due to the expected rise in seasonal demand, Korean Air will now operate the Incheon-Nha Trang service daily. The airline will also increase the frequency of some American routes in December and January, including the Seoul (Incheon)-Seattle/Tacoma and the Seoul (Incheon)-Las Vegas service which both change from five times a week to six times a week. The Seoul (Incheon) to Zagreb service, which is the first regular service connecting East Asia and Croatia directly, will merge with the Zurich route during the winter season. Therefore, the flight will operate to Zurich via Zagreb three times a week. The route between Seoul (Incheon) and Hong Kong will be increased from 28 times a week to 35 times a week to provide customers with a wider range of flight options. 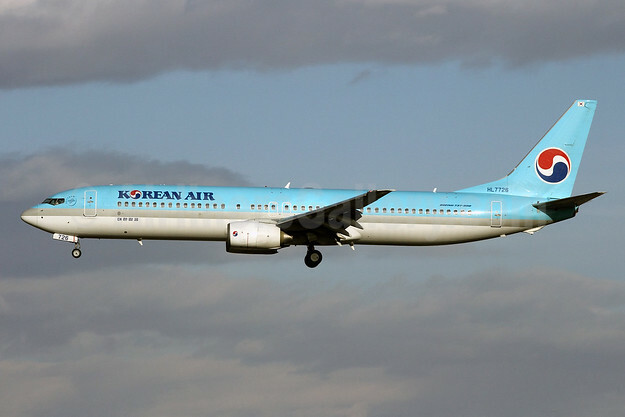 During the winter season, Korean Air will suspend selected flights including Incheon-St. Petersburg, Incheon-Irkutsk, Incheon-Nanning, Busan-Hong Kong, and Busan-Guam. Meanwhile, Korean Air will deploy recently introduced aircraft, such as Boeing 787-9 Dreamliner, Boeing 747-8 Intercontinental, and Bombardier/Airbus CS300 (A220-300) on the main routes, where the demand is expected to grow during the winter season, to provide a more comfortable flight experience. Top Copyright Photo: Korean Air Boeing 737-9B5 HL7726 (msn 30001) PEK (Michael B. Ing). Image: 907818. This entry was posted in Korean Air and tagged Boeing 737-9B5, HL7726, Korean Air, msn 30001 on November 1, 2018 by Bruce Drum.